Pathfinder Tours "Buffer Puffer" Took 37047 and 37203 on an eccentric tour of some London Branch Lines. After heading back out to South Ruislip from Marylebone the Tour heads back into Central London via Acton Main line, diverging from the Great Western Main line to the North London line via the Acton Curve. 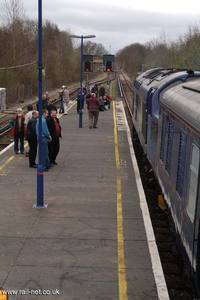 The train arrived at Hampton Court just behind a service train and the passengers, knowing there was a 45 minute wait, descended on the shops of Hampton Court. The poor chip shop probably didn't know what hit them! Still following the service train the tour is seen here, running to time, passing through Thames Ditton station. Last branch line of the day. the tour visits Shepperton. These view show the tour passing between the fairways of the Sunbury Golf course. The wind at this point was enough to blow you over.